Can I drink the water?^But I don't speak the language.^You want me to sleep "where?" ^They eat what?^How am I going to raise that much money?^Is it really God's will for me to go?Are you ready?More than one million people will go into all the world on short-term missions trips this year. Are you ready to be one of them?^Anne-Geri' and Greg have been in the field and led teams there-and back. They will help you prep and pack for the trip, put their arms around you while you're gone, and offer perspective as you reenter "normal" life.^"How to Get Ready for Short-Term Missions" will help you: Pack your suitcase and prepare your heartBuild genuine relationships with the localsUnderstand cultural differencesDeal with physical fatigueCombat stretched emotions^^There's even a chapter for clammy-handed parents!^With humor and experience, Anne-Geri' and Greg ask questions you can't hide from and help you focus on your true mission. 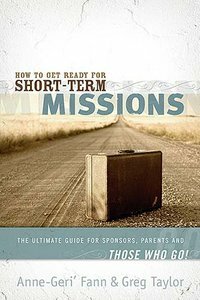 About "How to Get Ready For Short-Term Missions"